In the bass world, what do Johann Sebastian Bach, Procol Harum, Percy Sledge, Elton John and, oh, yeah (or rather “yeah, yeah, yeah”), The Beatles have in common? Highly successful songs that take advantage of inversions via a descending bass line. Quite an assortment of genres, isn’t it? The attack: Any time you begin with a non-root of a chord in the bass, the impact is a little softer than playing the root. This softer attack is sometimes exactly what the song needs. The voice leading of the bass line: You want to look for notes that are close to the one you played immediately previously. 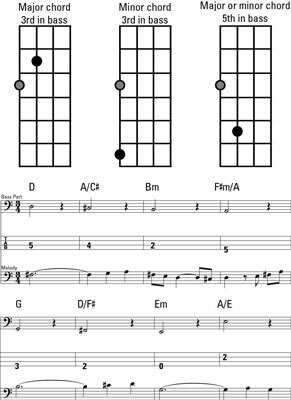 For example, if you play a C and your next chord is a G, you can play a B in the bass (the 3 of G) and move only a half step down (one fret). This process is called voice leading and makes a song move very smoothly through the harmony. The chord notation would show G/B, the G being the chord and the B the bass note that you play. 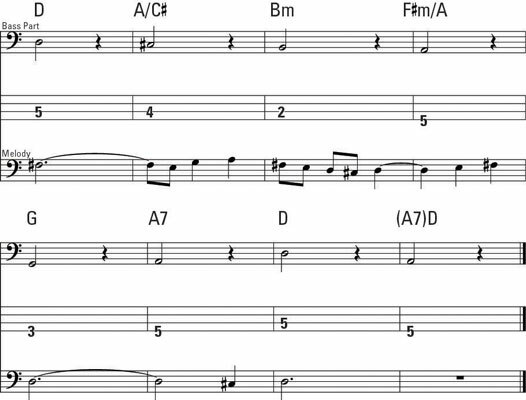 Here is a typical chord chart that just cries out for inversions in the bass part. This song uses inversions to add variety. Whether you’re are a raving Beatles fan or you just can’t deal with the mop heads, taking advantage of McCartney’s bass-accompanying genius is a great way to explore different options for creating a bass part for any tune. It comes in handy when you work with a composer who hires you to record one of his songs and tells you he wants you to play something “slippery, slinky” (huh? ).